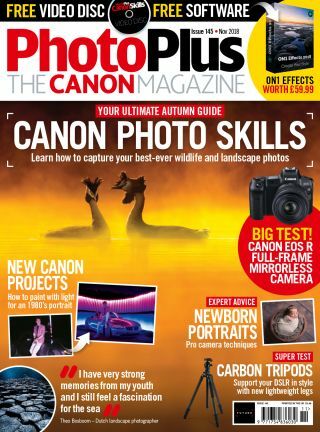 The new issue of PhotoPlus: The Canon Magazine is available now (as well as arriving in subscribers' postboxes) and it’s a real corker of an issue. In the new November issue no. 145 on sale today, we're giving everyone a free download of ON1 Effects image-editing software worth £59.99! Everybody knows that autumn is an epic time for photography, however not everybody knows how to capture the best aspects of the season with their Canon gear. In this month’s main Canon DSLR technique guide, we show you how to capture great photos of autumnal subjects, like colourful trees, landscapes, remarkable reflections in water, foraging wildlife as well as creative close-ups of vibrant leaves. We take our Apprentice out to a photostudio with a talented Canon pro photographer this month to learn how to take amazing portraits of newborn babies. We also talk to enigmatic Dutch landscape and seascape photographer about his deep bond with the sea and all things coastal. In our Canon Skills section there are new photo projects and image-editing tutorials to follow, including how to paint with light to take cool 1980’s-inspired retro portraits at night, and learn how broad and short lighting techniques and slim down or beef up your subjects. All come with free video guides to follow along with. And last but not least – we test Canon’s all-new camera, the mirrorless full-frame EOS R! Canon also reveals four new dedicated RF lenses and three adapters, one of which enables you to use your EF-S/EF lenses with the EOS R. We give you our honest verdict of this revolutionary camera system.